The project described by David Parker below would presumably result in the loss of the 1912 Union Building (Lido Cafe), and the 'plus size' version of the project being considered could also include buildings on 9A Street and 2nd Street, including the stucco apartment building on the SW corner of 2nd Avenue and 9A Street that is a local landmark. 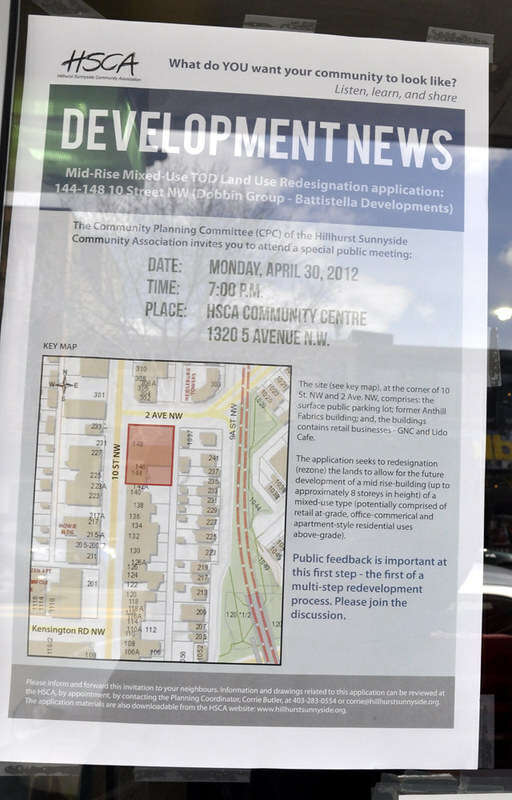 There's great news for shoppers and merchants of the Kensington area of 10th Street N.W. as an exciting development is being planned that will provide a good deal more parking. During the rush-hour periods street parking is not allowed on the busy north/south commuter road, but about a year ago the Calgary Parking Authority bought a surface lot at the corner of 2nd Avenue and the former Ant Hill Fabric store next door with the idea of building an underground parkade with retail and residential above. It seemed to have stalled but the time has been taken to negotiate with developers to enter into a joint venture agreement where more properties have been purchased to make the project bigger and provide more parking. Ritchie and Vincent Fung who have owned and run the Lido Cafe for many years are investors along with the Dobbin Group and Atlas Development, businesses with a lot of experience and understanding of the area, who are in discussion with the CPA to extend the parking further south under their site. The authority would manage the parking while the new partnership will build retail and office floors topped by a condominium tower. The initial design will go ahead but the developers are currently seeking arrangements with other property owners in the block to join with them in developing a much larger project. They would like to see three levels of underground parking -- more than doubling the initial proposal -- stretching from 10th Street to 9A Street using the back alley as a widened pedestrian walkway flanked by two levels of retail. Another two floors of office space would be built on both sides and then spanned with an archway supporting eight floors of residential condo units terraced back from 2nd Avenue. It's a great location within easy walking or cycling distance of downtown and just a couple of short blocks away from the Sunnyside LRT Station. The concept is an attractive one that will change the face of 10th Street providing not only much needed parking but a good mixed use of more retail, office and residential that will add a lot of life to the area. Chris Dobbin of the Dobbin Group and Michael Evans of Atlas Development have a real heart for Kensington. We got into a discussion of potential improvements for the wider Hillhurst/Sunnyside area and spent some time doodling with an idea to convert the red brick former fire station on the north side of the Louise Bridge into a fine restaurant with a large wooden dock over the Bow River that might harbour a boat to take people over to Prince's Island Park. Why not? Last edited by newsposter on Thu Mar 07, 2013 1:02 pm, edited 10 times in total. Why is it that whenever there is a building that is architectually or culturally significant in terms of heritage or 'different' in a city that is so lacking in these areas, that it has to be torn down??? ANd made 'modern'. Of course the block isn't designated and neither is Penny Lane, but that shouldn't matter! The fact that these structures and insititutions (a diner that's been around since the '30s) are still surviving in Calgary needs to be celebrated, not torn down! Simple. Cool, interesting areas of attractive urban design draw people to them, which in turn draws in developers who want to fulfill the wish of people to be able to live in said cool area, sometimes with the result of tearing out much of the coolness. It's sad, but oh so predictable. The apartment and the house next to it on 9A Street (see above) were purchased by the City for Calgary Parking Authority purposes on November 20, 2006 (the decision to purchase was passed by City Council). Presumably the City will be participating in a redevelopment of this site, including public parking for the Kensington area. There is still at least one tenant in the Apt block, so I'm guessing evictions haven't taken effect assuming any have been issued. It's been a long time since we've had an update on this project. The Calgary Parking Authority-owned land on 10th Street in Kensington. There is a lot of character and history on this block. Whereas previous incarnations of this proposal were to include include the Lido Cafe and the buildings across the alley on 9A Street (see above) it looks like this sale only deals with the Ant Hill fabric building (1941) and the parking lot on the corner. Heritage Considerations The land use redesignation application was submitted on 2009 December 14. The building located at 1037 - 9A Street NW was added to the Calgary's Inventory of Evaluated Historic Resources on 2009 December 11. In fairness to the owner, City protocol is to treat the site as if it is not on the Inventory, if the owner has not received notification prior to submitting an application. The Calgary Heritage Strategy (2008) encourages "owners and developers to incorporate historic interpretation as a component of all historic preservation projects or any new development where appropriate". City Heritage staff have been working with the Applicant who has agreed to provide a detailed recording of the historic resources on the site. The Applicant has also agreed to continue to work with Heritage staff to incorporate a significant historic interpretive element in the new development. Details will be required at the time of a Development Permit submission. Significance Summary from the City website. 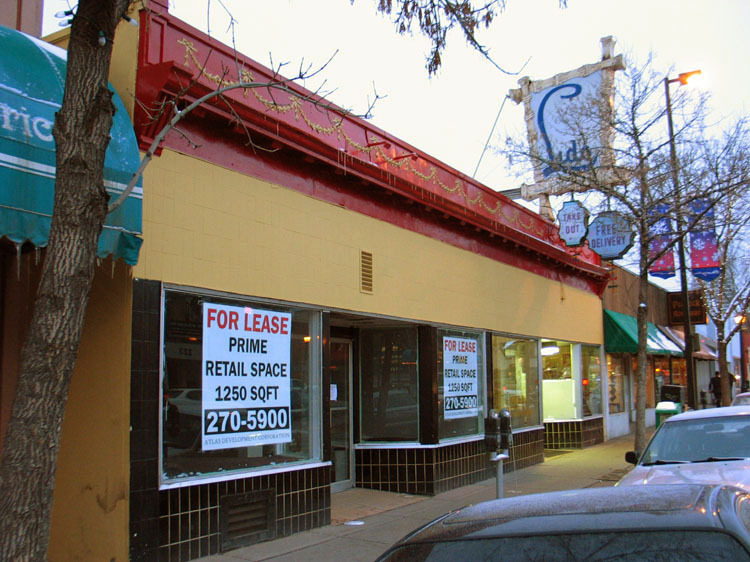 More recent news on the proposal noted in the very first posting in this thread for 10th Street that would take out Anthill Fabrics, etc. This is separate from the recently approved Battistella project on 9A Street also listed here thread. It’s big, it’s pink, and for the last six years it has been pretty much vacant in one of Calgary’s trendiest areas. It’s also a hot-button political issue, typically not publicly discussed — not by the area’s alderman, nor by the Kensington Business Revitalization Zone’s executive director. Last edited by newsposter on Tue Dec 28, 2010 11:11 am, edited 1 time in total. FFWD on Dec 23 reported that the proposed project for the Ant Hill site includes not only Ant Hill but the Lido Cafe property, and the same players as the original proposal from 2006 at the top of this thread. With direction from Heritage Planning, the applicant will be providing several historic features in commemoration of the existing building located at 1037 – 2 Avenue NW. The features will include 2 bronze medallions and two commemorative wall mounted plaques. The bronze medallions will be located within the public sidewalk at the corner of 2 Avenue NW and 9A Street NW, the other adjacent to the lane within the small plaza seating area. Both commemorative plaques will be located on site, one near the northeast corner of the building, the other behind the bench seating at the northwest corner of the site.